Introduced in 1968, the Model 36 is a six-seat utility aircraft. 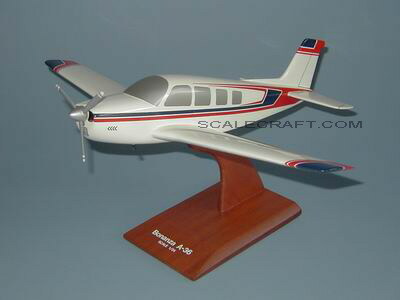 This airplane is basically a slightly lengthened (10 inches) version of the V35B, combining the tail unit of the Model 33, and the strengthened landing gear developed for the Beech Baron. This airplane also has double doors on the starboard side of the fuselage, making it easier to load or unload cargo when used in a utility role. Mahogany Wood. Scale 1/24. Wingspan 16 1/2 inches, Length 13 1/2 inches.